Vacation in southern France. Two weeks in Roussillon, a beautiful little village in the Provence. We had rented a house for two weeks and had fun mainly eating an hanging out at the pool. But after a couple days of that I was already getting antsy to climb some of the mountains in the vicinity. Still working on my list to climb the highpoints of the 96 French departments, I chose a couple of those as my destinations for the day. The alarm went off at 3am and five minutes later I was driving. The first summit, Mont Lachens was 2.5 hours away and I had thought that I could drive during the night and then arrive at the summit (there is a road leading all most all the way to the top) just in time for sunrise, but I was so tired at about 5am and still half an hour short of my goal that I pulled over and slept for over an hour No problem, I would also appreciate the summit in daylight. However, when I reached the ended of the paved road and had to park my car, I realized that maybe darkness would not have been such a bad idea, because the higher of the twin summits was cluttered with antennas, a fence, and a number of buildings. The fence was half collapsed and there were pieces of barbed wire lying around everywhere. Not very pretty. I worked my way up the last 100 metres to what I thought was the highpoint. But I then realized that inside the fence there was a higher spot and now I was glad about the sordid state of the fence, because with some caution I could climb over it and enter the formally fenced off area and thus the highest point. I took a few shots on the summit. The surrounding mountains were barely visible because of the morning haze, but to the South I could see the ocean, which was a sight you don't often get on a mountain top. After a few minutes I left the top and headed over to the other summit. At the col between the two there was a take off area for paragliders, but noone made any use of it yet. Probably too windy. 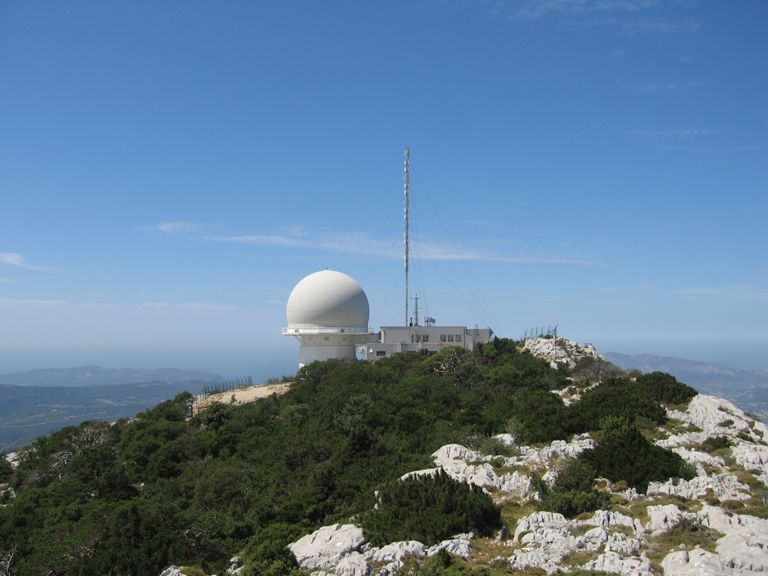 The other summit was relatively nicer in that it was only cluttered by one antenna-like tower and a small building, almost like a summit shelter but locked. I also found a view table, meaning a half circle of one meter high concrete with a smooth surface and a 180 degrees profile of the surrounding area right in front of the viewer painted on top of it. Major summits and cities on the profile were labeled and I learned that Saint Tropez and Cannes were not to far from my present location. It was not quite 8am when I decided to get back in the car and leave the summit. I programmed the GPS for my next destination and was horrified to realize that it was another 1.45 hours to it. The day was just beginning, but I was so tired and I was tempted to drive straight back home and sleep. But, I knew that I would be regretting such a decision later and therefore started driving on the very windy roads towards the next mountain, Bertagne, highpoint of the Bouches-Du-Rhone department. Luckily, after an awful 30km drive on roads that were more windy than Highway 1 in California (the one were I as the driver got car sick), I arrived that the autoroute. I got to the city of Plan-d'Aups Sainte Baume at around 9.30, but could not anything that was at least on my map clearly marked a as a paved road to the 1000+ meter summit. Thus I stopped at the tourist information, where the attendant was happy to sell me a hiking map of the area before telling me that the road is closed to the public. Zut, I thought, what to do next. I had promised to be back home by noon, but I also wanted to climb the peak. My egotistical me won and I called Catherine to say that I would not be there for dinner. I then drove to the Col de Espigoulier, which at 700 meters in elevation and about 1.5 km in distance was the highest and closest I could get to the summit. The topo map also clearly marked a path crossing the col and leading to the summit. Once there I parked the car and headed straight up to the rock climbing formation, from where I thought it should be easy enough to find the trail. I was using a very faint trail, which I lost repeatedly, but I stick to the idea of staying as high as possible and heading into the general direction of the summit which was always in plain sight. However, I had not counted on the brush that I had to cross once lost on the use trail. Horrible, awful bushes with lots of sharp leaves, branches and pointed spikes and there was me in a t-shirt and shorts plowing right through them. Eventually I could see the real trail further below, but I headed not straight to it, because I did not want to lose elevaton. Well, that decision cost me lots of blood, because when I finally got to it, my legs and arms were covered with scratches and blood was running down them. Aaahhhh! Well, eventually, all frustrated and after losing about 45 minutes (I write this in retrospect and the way down it become clear to me how stupid I had been to take that detour), I found the trail that was leading in the right direction and soon after got to a crossing where the post with the trail markers had fallen over and broken. I tried to re-assemble the pieces and find out which marker was supposed to go where and after a few minutes was pretty sure that I had to continue straight. Not just because it was the obvious direction to where I had the steep face of the summit in plain sight but also because the other two trails where faint use trails rather than a major path. Thus I continued and crossed a couple of "rock ribs" before starting with the steep part of the hike. The summit could barely be another 100 meter of elevation above me, straight above me, and I was expecting some class 3 and 4 scrambling, but luckily a combination of switchbacks and ramps that I had not seen from below, allowed me to avoid all sections too steep. Also there were red markings on the rock and after about 10 minutes I finally topped out at the summit. At least I thought it was the summit, because a nearby outcrop of rock (with an antenna and an observatory on top) looked to me to be of equal or higher elevation. However, after studying the summit area in detail, I found a marker of the Intitute National Geographique de France and decided that this must be it. I took a couple of shots, but then nevertheless ventured over to explore the fenced in observatory and take a couple more shots from that points, as I thought that the views of the ocean and Marseilles in the distance were even better than from the summit. The whole area reminded me to some extent of the tepuis in Venezuela (to a lesser extent admittedly), but I could see a number of "table top" mountains with steep drop of in the neighborhoon and knew that my own position was of a similar shape. Bon, enough of that, after taking another 20 pictures or so, I sourrounded the observatory (the Marseilles aviation center, as I was to find out a few minutes later), crossed the main entrance to it (with a nice paved road that it would have been so much fun to drive on) and retraced my way to the red markers leading the way up (and down). After another 30 - 40 minutes I arrived back at the car and realized that the trail started just about 50 meters from where I had parked and ventured of into cross-country territory. If I had just gotten over my theme of not losing elevation and I actually would have descended the road for thirty seconds, I would have found the easy "entrance" to the trail and avoided all the suffering in the brush. Oh well, too late for comtemplating that. I got in my car, drove back to Roussillon and jumped in the awesome swimming pool at our house. It was nearing 35 degrees and therefore absolutely necessary.